Do you hear yourself saying, “I’m not going to buy one more piece of fabric until I use what I have!” Yeah, me too. The quilt is finished, the binding is sewn on, and the quilt is on its way to its new owner. And then you see it in the corner of your eye. A messy stack of colorful prints – small pieces – stuffed in a bag, tucked away. The leftover scrap pieces. The quilt is gone, the scraps remain. Now what? If only you could push the scraps under the rug and forget about them. Out of sight, out of mind, right? But you know they are there. 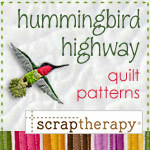 ScrapTherapy, Cut the Scraps! 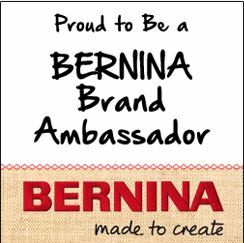 is here to help! 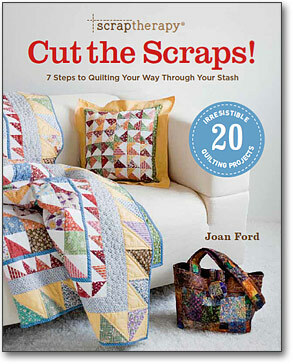 Take those leftovers from your quilting memories and make beautiful scrappy quilts. 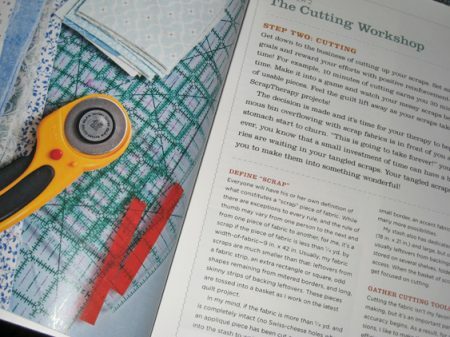 Follow seven easy steps to get organized, choose your scraps for the project, and get it done! Tons of variety! Fun stories and 20 projects to assemble, using from the leftover fabrics you already have. And don’t leave out that trip to the quilt shop! Shiny new fabrics and notions are allowed as you turn something old into something new. Want it now? Follow the links below to purchase the book from major booksellers. 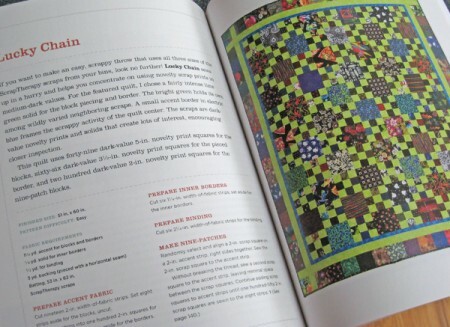 Or better still, run out to your favorite independent quilt shop, and ask for the book there. While you’re there, pick up a couple of yards of fabric (why not!) – tell ’em that little hummingbird sent you. Or go to our cart to place your order. You’ll be cutting, organizing, and sewing before you know it! Half of the projects in the book are only available in the book. Library Journal selected ScrapTherapy, Cut the Scraps! in its list of best books for 2011!